This evening we had a talk on daffodils by David Gillam who has, years ago, entered our shows in this very hall. He is now a national daffodil and dahlia grower. He shared some of his tips for growing and showing daffodils. Our March meeting will include our Daffodil Mini Show and it is hoped this talk will encourage lots of members to bring their blooms along. We also launched our seed potato competition for the Autumn Show in September. All you need to do is get one of our seed potatoes and a bag and get growing. 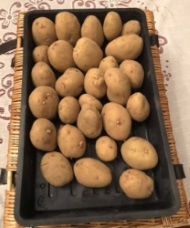 The variety of potato is vales sovereign after some fantastic results in 2018. These should be planted out in April with some compost and watch them grow. Get in contact today if you would like one. For members the cost is 50p. For non members it is £1. 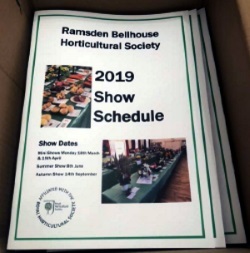 The Schedule details the monthly meetings, social events and show dates for 2019. It also sets out the wide variety of classes for our Summer and Autumn Shows. These Schedules will also be hand delivered to every house in Ramsden Bellhouse, with our committee out delivering in the next few weeks. 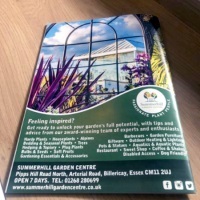 A huge thank you to Summerhill Garden Centre who sponsor our Schedule and feature on the back page. Get yours today!